Girina O.A. 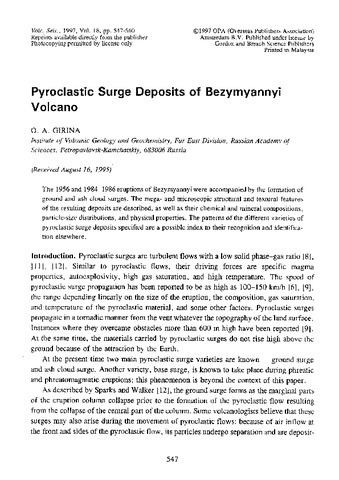 Pyroclastic surge deposits of Bezymianny volcano // Volcanology and Seismology. 1997. V. 18. № 5. P. 547-560. Girina O.A. Volcano monitoring and alert system in Kamchatka and Northern Kuriles // International Workshop on Progress of Research for Disaster Mitigation of Earthquakes and Volcanic Eruptions in the North Pacific Region. ISTC. Sapporo, Japan. May 10-13, 2010. Sapporo, Japan: Hokkaido University. 2010. P. 65-69. Girina O.A., Bogoyavlenskaya G.E., Demyanchuk Yu.V. 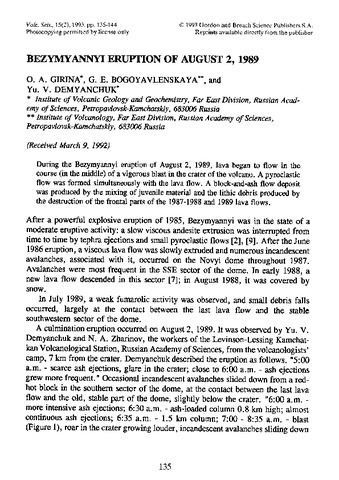 Bezymianny eruption of August 02, 1989 // Volcanology and Seismology. 1993. V. 15. № 2. P. 135-144. Girina O.A., Bursik M.I. The Formation of the Chute and the Channel at the Foot of the Andesitic Dome of Bezymianny Volcano // V52B-02. // Abstracts. AGU Spring Meeting 2000. Washington D.C.: 2000. Girina O.A., Bursik M.I. The Movement of Block and Ash Flows in Channels // Abstracts. 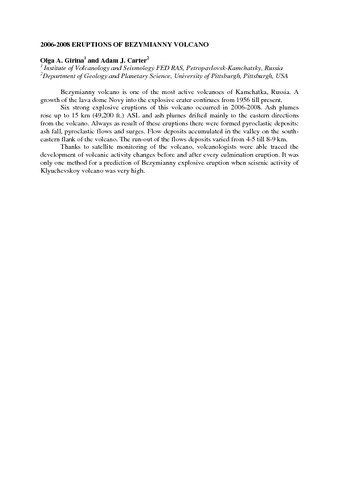 AGU Spring Meeting 2000. Washington D.C.: 2000. № V52B-0. Girina O.A., Chubarova O.S., Senyukov S.L. 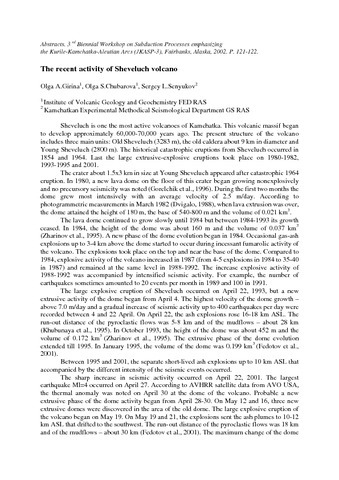 The Recent Activity of Sheveluch Volcano // Abstracts. 3rd Biennial Workshop on Subduction Processes emphasizing the Kurile-Kamchatka-Aleutian Arcs (JKASP-3). Fairbanks. June 2002. 2002. 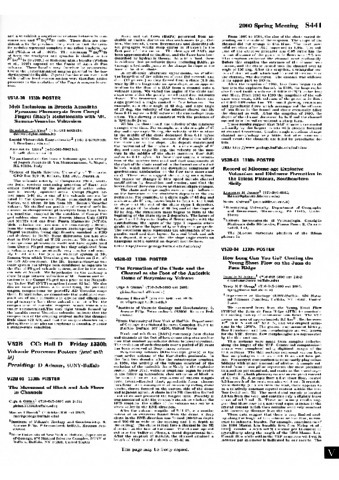 P. 121-122.